These Dairy Free Triple Chocolate Chip Cookies are the best dairy free cookies you’ll ever try. Just one bowl & 12 ingredients and 20 minutes to make this vegan chocolate chip cookies. When living a dairy free diet, there’s certain things that you desire. An amazing dairy free cookie without the sacrifice is definitely high on many people’s list. 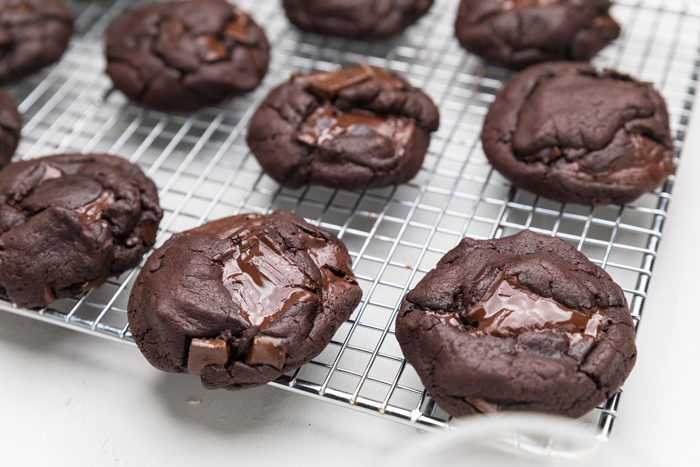 This recipe for our dairy free triple chocolate chip cookies is the answer to all your needs. It’s seriously the most delicious cookie we’ve had since going dairy free. It hits all the notes of the most delicious dairy free cookie you’ve had. 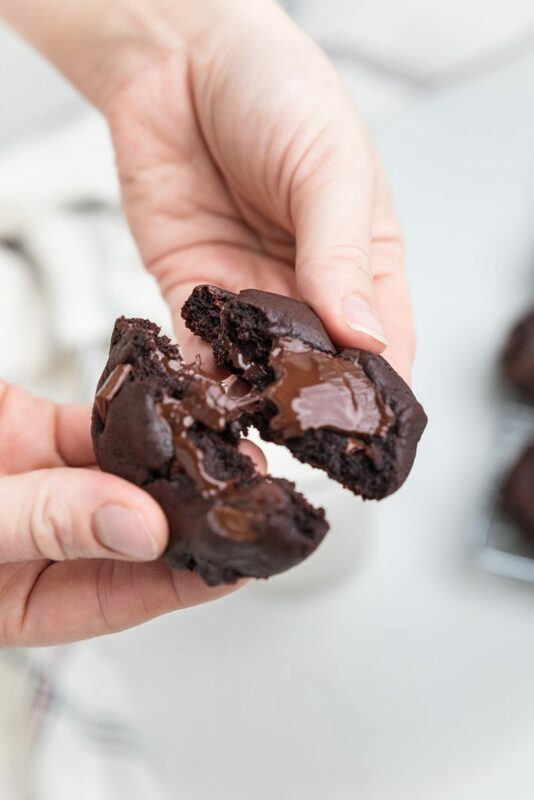 These dairy free triple chocolate chip cookies are made with easy to find ingredients. Meaning that you don’t have to go all over the place looking for them. You’ll be able to grab the ingredients at Target when you are out shopping for the thing you are likely going to forget. 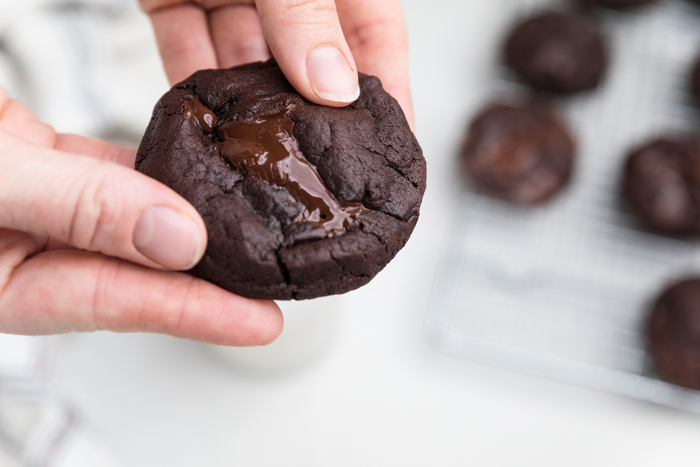 What ingredients do you need to make dairy free triple chocolate chip cookies? 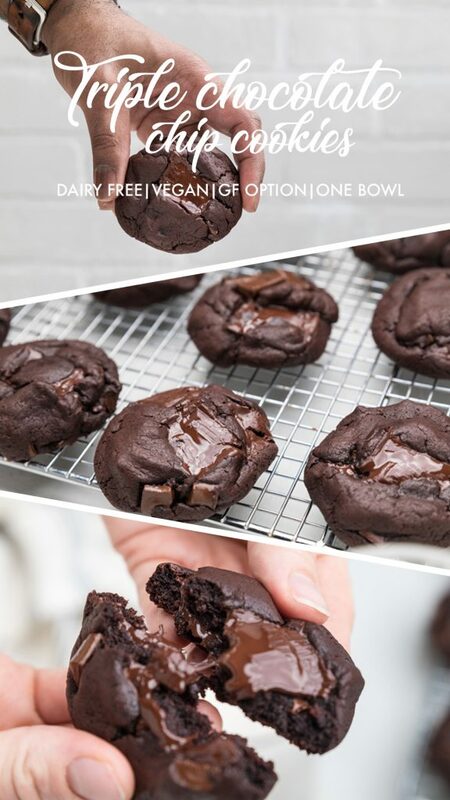 How do you make dairy free triple chocolate chip cookies? 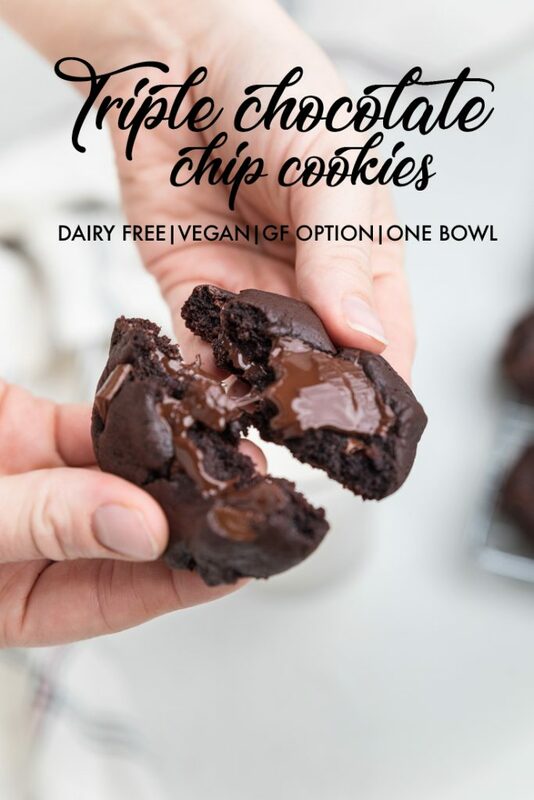 These dairy free triple chocolate chip cookies are really easy to make and we love that only one bowl in needed. To start, preheat your oven to 375 degrees. In a large bowl, add in the coconut oil, brown sugar, vanilla extract, coconut milk, applesauce and vegan shortening. Beat those ingredients together with a mixer. Then, add in the flour, baking soda, and salt. Stir together. This will be a very thick cookie dough. Fold in the chocolate chips and chocolate bar chunks. Roll into balls, approximately 2 tablespoons in size and place on a parchment lined baking sheet. Cook for 8-12 minutes. Remove and let cool. 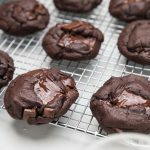 Tips for making dairy free triple chocolate chip cookies? 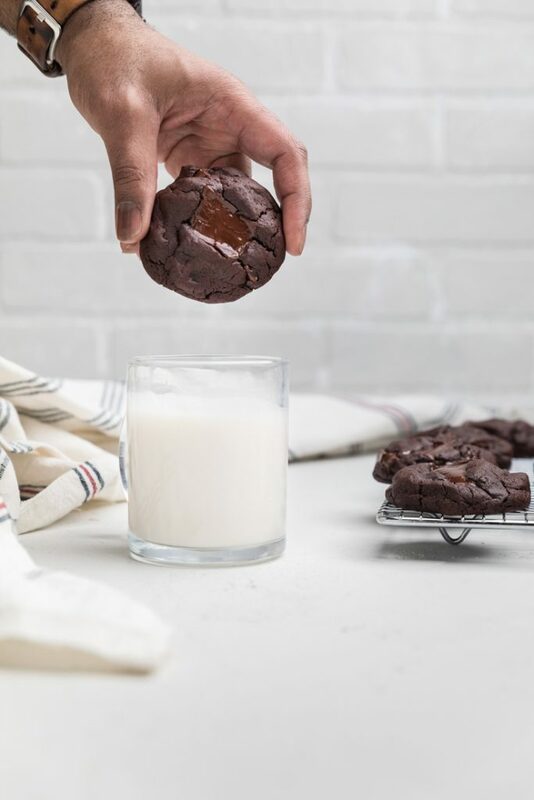 We wanted to share some tips with you for how to make these the best dairy free triple chocolate chip cookies you’ve ever had. It’s easier to have you can of full fat coconut milk refrigerated prior to making this recipe. If you don’t have one the best bet is to carefully open the can without shaking. You are trying to get the thick, fat part of the canned coconut milk, so these are your best options. For the cocoa powder, we prefer to use Hershey’s Special Dark chocolate powder. For the chocolate chips, we use Enjoy Life Semi-Sweet Mega Chunks. Finally, for the chocolate bar, we like using a 70% dairy free chocolate bar, cut into approximately 24 pieces. After you try our dairy free cookie recipe and see how easy it is to make delicious dairy free cookies, you may be looking for other dairy free cookie dough recipes. We’ve got you covered! WHERE DO YOU FIND DAIRY FREE CHOCOLATE CHIPS? Luckily, you don’t have to go far to find dairy free chocolate chips anymore. It is important to know that dairy free chocolate chips are more expensive than ones that are not dairy free. You can find dairy free chocolate chips at almost any grocers now, not only Wegman’s or Whole Foods like even just a few years ago. Many Targets are also now caring a brand of them. *TIP* If your Target or local grocer doesn’t carry them, ask to speak to a manager about getting them. And if you never want to leave your house, you can find them dairy free chocolate chips on Amazon. In a large bowl, add in the coconut oil, brown sugar, vanilla extract, coconut milk, applesauce and vegan shortening. Beat those ingredients together with a mixer for 3 minutes. Then, add in the flour, cocoa powder, baking soda, and salt. Stir together. This will be a very thick cookie dough. Fold in the chocolate chips and chocolate bar chunks. Roll into balls, approximately 2 tablespoons in size, and place on a parchment lined baking sheet. Cook for 8-12 minutes. Remove and let cool.